Upper Grinnell Lake has been formed by the melting of the Grinnell Glacier. As the glacier retreated, or melted, the melt water formed a lake in the depression where the glacier use to be. 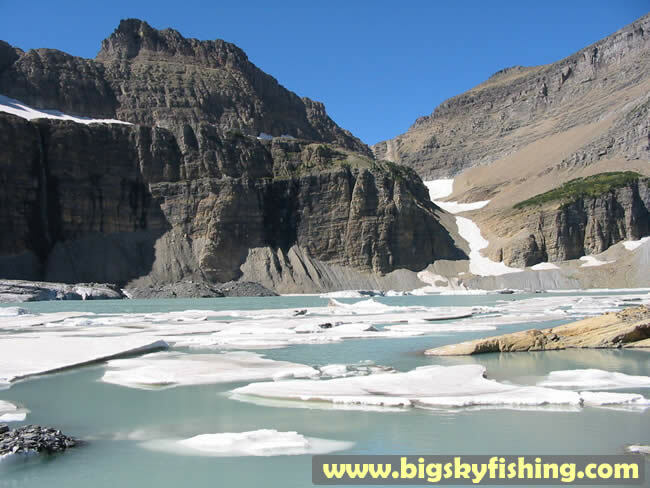 As Upper Grinnell Lake is fed entirely by either the melting of the glacier or from snowmelt, the color of the lake is milky white and has no nutrients (and thus no fish). Additionally, as Grinnell Glacier melts, big chunks of the glacier frequently break off from it. When this happens, the chunks of ice can float around in the lake for weeks at a time. Seen here is Upper Grinnell Lake in October, still full of floating ice.